SUMO-WiFi top > ︎Booking Wi-Ho! 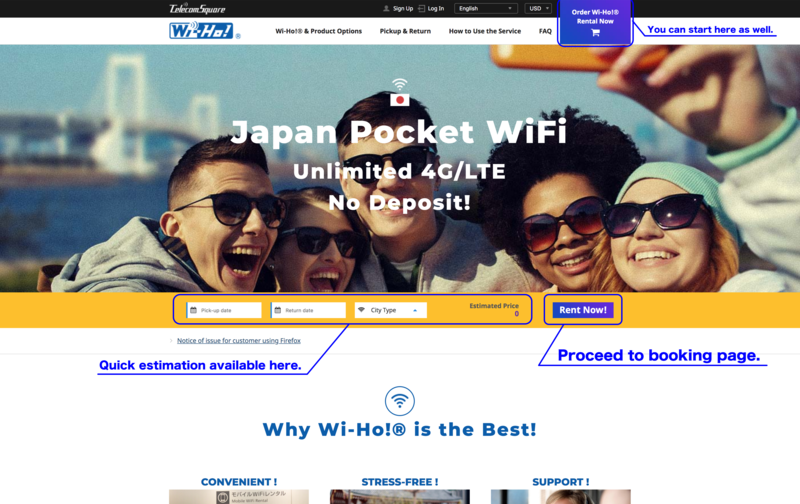 Here are 6 steps to book a reasonable pocket WiFi at Wi-Ho!. 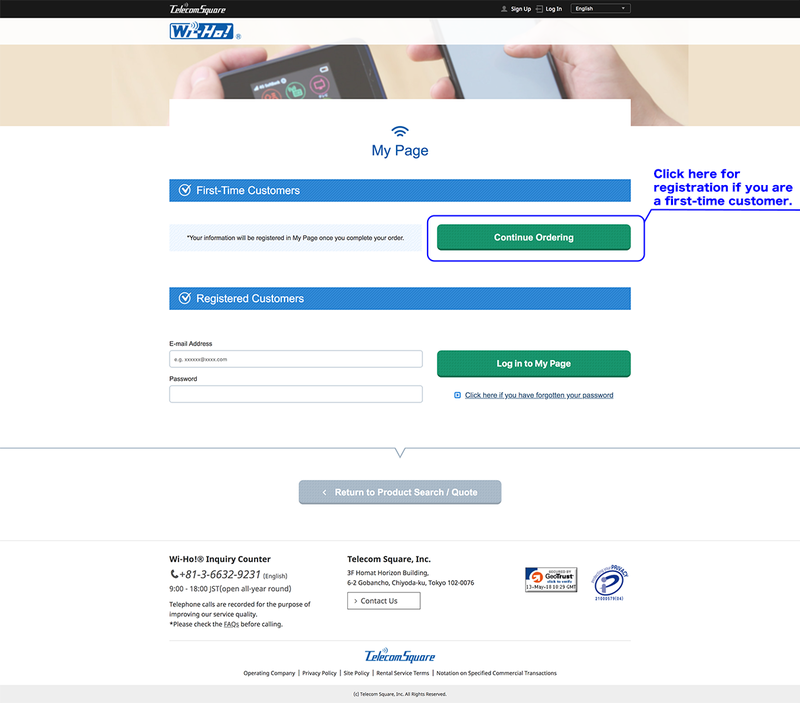 You can get a quick estimation before proceed to a booking page. Input pick-up and return date and select WiFi router type, which are "City Type" and Wide Type"*. Or you can start from "Order Wi-Ho! Rental Now" button at the right top as well. * "City Type" has powerful LTE connectivity in urban areas. "Wide Type" covers throughout Japan. Here you decide your rental plan including where to pick up and return. And then you need to register your info. If you are a member please log in My Page here. Input your information here including your credit card info. 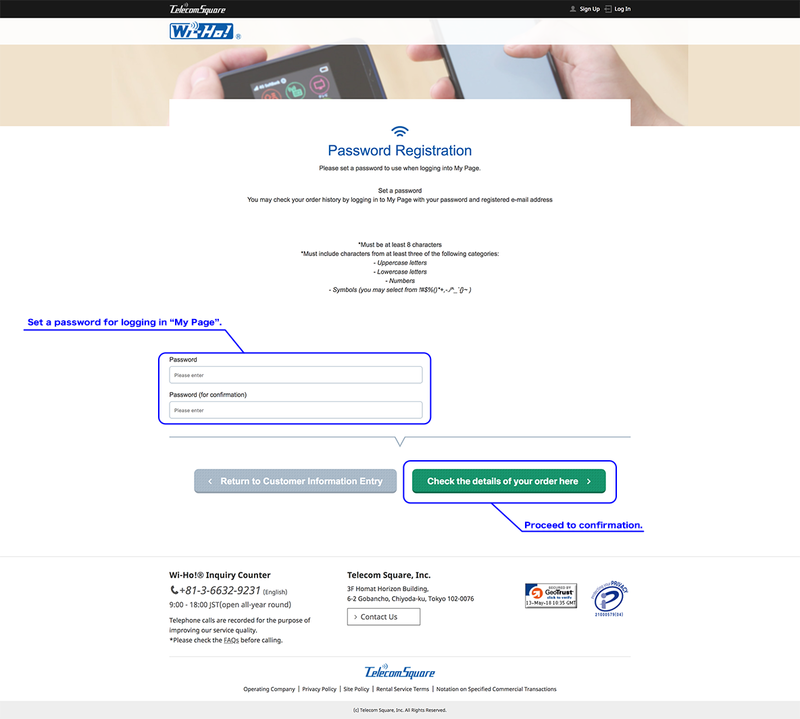 Here you need to set a password for logging in "My Page". The deadline for orders differs in accordance with the method of pickup. You will not be charged if you cancel your order at least three days prior to the pick-up date. Cancellations made one or two days before the pick-up date will incur a charge.You will be charged USD 17.86 (including tax) per unit if you cancel your order one or two days before the desired pick-up date. Your reservation is confirmed once you receive an order confirmation form and the receipt.We will send you an e-mail with an attached order confirmation form and the receipt as confirmation of your order. MCan I ask somebody else to pick up the products at the airport counter on my behalf? Yes, you can. Please ask your representative to bring your order confirmation form and a document to prove identity*.